A great number of people came together on Saturday morning to commemorate Gaelic Sunday a hundred years to the date . In our Dressing rooms we had a wonderful museum display where we had some wonderful memorabilia on show from All Ireland Medals ,Leinster Medals, County Medals from our past players, Rhode and Offaly Jerseys of the past. Cups, All Star Trophies, Awards, Programme’s , footballs and wonderful photographs. Also a key part of our museum was Fahy Handball club with array of photo’s and medals. Our Museum was packed with people throughout the morning. On the Button of 11am Stephen Darby spoke to the crowd of the significance of Gaelic Sunday and then asked Club President Paddy McCormack to Raise the Tri-colour to full mast to a round of applause. Which was followed by the playing of the National Anthem where the crowd and young boys and girls stood proudly. The Teams of young boys and girls then went and played their football games where they displayed their wonderful talent . Following the games the kids were presented with minerals and crisps. For the parent’s there was plenty of refreshment;s and treats throughout the morning. It was a truly wonderful and historic morning for all in attendance especially for the boys and girls who took part in the blitz. Many thanks has to go the team trainers of the boys and girls teams who took part on Saturday morning . Special thanks to the parent;s for supplying refreshments and Regina Swaine who kept the tea and coffee flowing throughout the morning. To all who supplied/ helped us make the Museum a massive success thanks a million for gifting us your medals , programme’s Jerseys and much more for Saturday. It is very much appreciated. Massive thank you to Peter Kilmurray for making fantastic canvasses for holding medals, Declan Cox for the sound system, Joe Malone Robert Kellaghan and Jody Kilmurray for there help. Special Mention has to go to Under-age Chairman Stephen Darby and Secretary Tracey Murphy for there great work in organising this wonderful event. Following on from a great morning and evening for the club and Senior Team winning we all Came together to killeens Lounge for music by Caz and a BBQ. On The night two presentations were made by Tracey Murphy on the behalf of the under-age Club. First presentation was made to the Rhode/Croghan Lourdes fund where Tracey presented a cheque for €665 to Caroline Aspell and Luke Kellaghan. The Second Presentation was to club President Paddy McCormack Tracey presented him with a frame of photographs marking his role as Grand marshal in our second only St.Patrick’s day Parade. Many Thanks to Colm & Cathriona Kileen and local butcher Ray Dempsey . Rhode Senior Footballer’s defeated near neighbour’s Edenderry on Saturday evening last 1-16 to 0-13 at the opening of their new pitch. Rhode were in control for most if not all of the game and at the half rhode led by 1-10 to 0-08 . In the Second half Rhode kicked a further 6 points to Edenderry’s five and the final score read 1-16 to 0-13. It was a great win especially beating at home but there are two more rounds to go with Tullamore coming up next. Team: Ken Garry, Brian Darby, Eoin Rigney, Jake Kavanagh, Gareth McNamee, Niall Darby, Shane Sullivan, Alan McNamee, Conor McNamee, Pauric Sullivan, Ruairi McNamee, Ciaran Heavey, Paul McPadden, Anton Sullivan. Niall McNamee, Subs Dylan Kavanagh for Alan McNamee, Shane Lowry for Ciaran Heavey, blood sub Mark Rigney for Ruairi McNamee, (Ruairi Returned to playing field. ) Mark Rigney for Ruairi McNamee. Well Done to the Rhode boys and girls who played Edenderry at half-time of the Senior Game. Rhode Junior A footballers continued their undefeated run in the group stage of the championship when they beat Ballyfore on a score-line of 1-16 to 0-06 on Thursday evening last in Rhode. 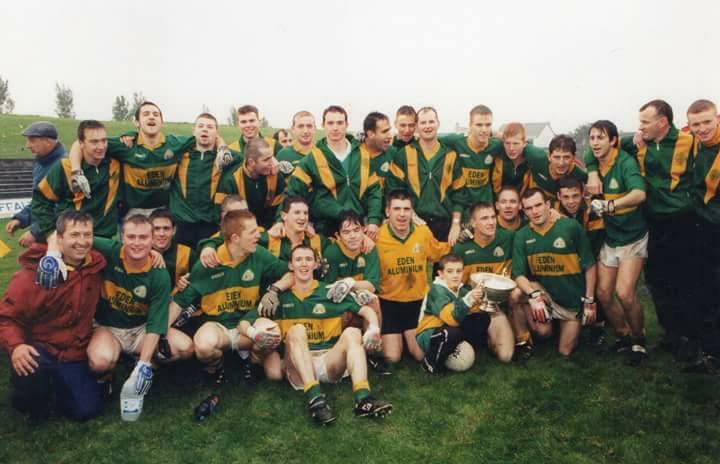 Team: Phil O’Connell, Damien Jones, Declan Murphy, Derek Cocoman, Jack Kilmurray, Keith Murphy, Dan O’Brien, Aidan Brereton, Lorcan Reilly, Keith Kerrigan, James Murphy, Anthony Kilmurray, Stephen O’Connell, Donal Hickey, Robert Leavy. subs used Luke Doyle, Kieran Hope, John Murphy, Jack Downing, Dan Reilly, Ricky Cully. Rhode Juniors final group game will be in Fr.Dowling park Rhode on Monday 20th against Durrow. Rhode U15 footballer’s play st.Broughan’s in the championship on Monday August 13th at 7:30pm in Rhode. Rhode played out a draw in the first round of the U.17 championship on Wednesday evening against Kilcormac/Killoughey with the full-time score reading 2-08 to 2-08. On Sunday morning Rhode u17’s took on Shamrocks in Rhode as match was moved from Ballinagar where they lost out on a score-line of 2-13 to 2-08 .